The whole family will be arriving soon, so get your stuff together and go find us a turkey! Click here to play! There is plenty to earn if you manage to be successful, with huge cash payouts on offer to anyone who can bring us the biggest turkey. Play Turkey Time today across three reels and a single pay line. There is plenty to play for in this traditional 3-reel slot, so come on in and win big. The Pilgrim's Hat is Wild and will payout when it appears on any line. Additionally, if you spin three of them at once you will earn 2400 times your original bet. If you manage to find the elusive Turkey, you will be sent into the bonus round where you will pick a turkey with, hopefully, the biggest cash payout behind it. 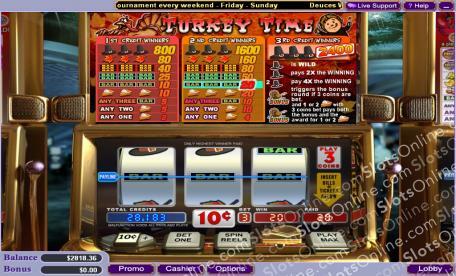 Play Turkey Time today for your chance to pick up huge payouts, just in time for Thanksgiving! The Pilgrim's Hat is Wild and will earn you 2400 times your initial wager. Land one or more Bonus Turkey round symbols and you'll be sent to the Bonus room where you have to select a turkey and win big.